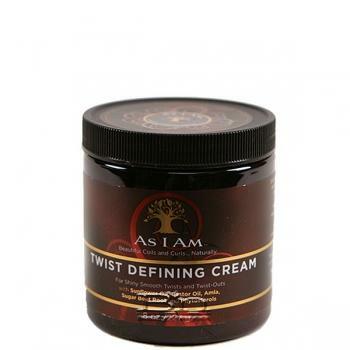 As I Am Twist Defining Cream for Shiny Smooth Twists and Twist-Outs with Sunflower Oil, Castor Oil, Amla, Sugar Beet Root and Phytosterols.Shiny smoothness, (and lots of it), is what you'll get when you twist with this one-of-a-kind rich creamy styler. Made especially for highly textured hair with nurturing natural oils, plus an organic extract that provides the ultimate in moisturization. There's even a wondrous organic compound blended in that works to block DHT and stimulate healthy hair growth. Directions: Use after cleansing and conditioning your hair. (Do not towel dry or blot after your final rinse.) Apply As I AmÂ® Leave-In Conditioner liberally, according to instructions. This will help prevent flaking once hair is dry. Apply Twist Defining Cream to detangled hair while it is wet, in small sections from root to tip, then twist away! Spray with water if hair begins to dry before you're done. Air drying is recommended. You may use a hood dryer on the low setting if time or weather is an issue. For twist outs, undo twists and separate, only after hair is completely dry. For added moisture, scrunch Moisture Milk or DoubleButterÂ® Cream onto hair, daily or whenever needed. You may use Twist Defining Cream for shingling, too, by combing it section-by-section through clean, detangled soaking wet hair with a wide-toothed comb. Dry thoroughly before manually fluffing and separating for style.